Sometimes I have a lot of trouble sleeping. Ideas like this come to me and demand to be made. Dream house right here ! On the one hand, I totally want to live in this place. On the other hand... what if it falls over? 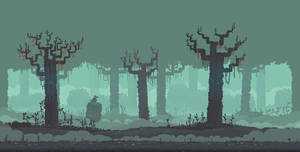 I LOVE this kind of pixel art. I use photoshop most of the time for most of my work. But I also use plenty of other things depends on what fits my goal really. One could do pixel art on a phone just as easily as in microsoft paint or basically whatever does raster graphics. Reminds me of Castlevania. Excellent work. You'd certainly be set in the event of a massive flood! lol Very cool! It looks like a children's favoret game. Neat pixel art of this fantastic castle!